The Buddhist concept of reincarnation, while both mysterious and enchanting, is hard for most westerners to grasp. 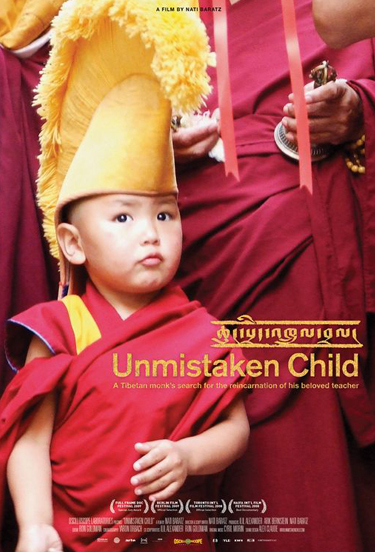 UNMISTAKEN CHILD follows the 4-year search for the reincarnation of Lama Konchog, a world-renowned Tibetan master who passed away in 2001 at age 84. The Dalai Lama charges the deceased monk's devoted disciple, Tenzin Zopa (who had been in his service since the age of seven), to search for his master's reincarnation. Tenzin sets off on this unforgettable quest on foot, mule and even helicopter, through breathtaking landscapes and remote traditional Tibetan villages. Along the way Tenzin listens to stories about young children with special characteristics, and performs rarely seen ritualistic tests designed to determine the likelihood of reincarnation. He eventually presents the child he believes to be his reincarnated master to the Dalai Lama so that he can make the final decision. Nati Baratz was born in Jerusalem, Israel. He has been working as a freelance director and producer since graduating from the Film School at Tel-Aviv University in 2000. His most notable films include TEL AVIV-KYRGYZSTAN (2001) and NOCHES (2004). Both documentaries were broadcast on TV in Israel. Features 8 additional scenes including:. -Monks debate the separation between body and mind. -Tenzin attempts to rescue an ant from his prayer book. Monks prepare the child to meet His Holiness the Dalai Lama. Includes exclusive essay on reincarnation by Buddhist scholar Robert Thurman.